If purchasing or renting from companies other than Pearson, the access codes for Pearson’s MyLab & Mastering products may not be included, may be incorrect, or may be previously redeemed. Check with the seller before completing your purchase. 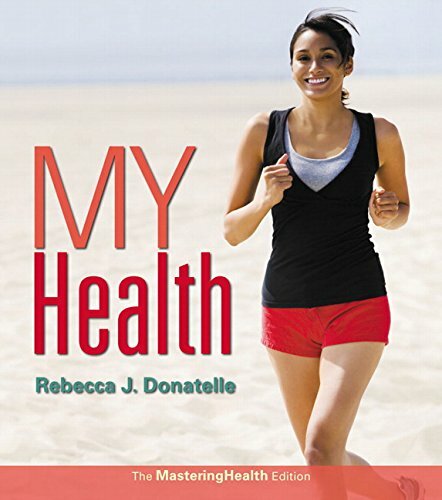 The Second Edition of My Health: The MasteringHealth Edition delivers the latest in personal health with tools that help students tackle what they need to know, within their own time constraints. The book’s modular organization allows students to focus on learning the core material they need to know, while Learning Outcomes and review questions provide them with immediate feedback on what they’ve learned and allow them to customize their study plan. Meanwhile, a concise text and a comprehensive supplements package helps students zero in on what they need to know–without the jargon–making personal health courses more rewarding. The MasteringHealth Edition is designed to work with MasteringHealth to provide students with concrete learning goals, giving instructors an invaluable tool for assessing students’ progress. The book builds on the power of MasteringHealth by tying its learning goals to a variety of interactive activities and assets. MasteringHealth is an online homework, tutorial, and assessment product designed to improve results by helping students quickly master concepts. Students benefit from self-paced tutorials that feature immediate wrong-answer feedback and hints that emulate the office-hour experience to help keep students on track. With a wide range of interactive, engaging, and assignable activities, students are encouraged to actively learn and retain tough course concepts.